Today I’ll continue in the same vein as yesterday’s post, this time broadening our scope to include the entire league, rather than focusing on just the Eagles. First, however, I have to acknowledge the news yesterday that Donovan McNabb will be retiring as an Eagle in the fall (looks like it will likely happen before the KC game so Andy is there). Objectively speaking, McNabb was a fantastic QB who every Eagles fan should love. I’m not going to go through his numbers today, but it’s safe to say he’s one of the more under-appreciated stars of the league, due entirely to the lack of a Super Bowl ring. The NFL, more than any other league (thought the NBA is close), judges its best players (QBs) almost entirely on Championship performance. In my opinion, that’s ridiculous; but it is what it is. If McNabb takes home that SB ring (he was damn close), both he and Andy become true sports royalty in Philadelphia. Although I typically stay far away from any conspiracy theory, you will never convince me that the Patriots didn’t cheat in the Super Bowl. While that is a subject for another day, given when/how they were found out and the subsequent destruction of the evidence (shady and inexcusable), there is strong logical support for the Super Bowl cheating theory. If that doesn’t happen, McNabb is a HOFer. We should all treat him as such anyway. Now let’s take a look back at the league, starting with the 2000 season. Yesterday, in an effort to discern just how good each Eagles offense and defense was, I measured every team against the rest of the league from that year, presenting the results in a +- % format. Two caveats before we get to the best defenses. One, the league averages INCLUDE each subject team; so the historically great teams, in fact, outperformed the league by slightly more than what is shown below. Two, I did not go through every team’s season to see if they “shut it down” after clinching a playoff berth. Some likely did, which would have an effect (relatively small) on the subsequent rankings. Also, what we are looking at here is Points Allowed. This is a little different from looking at the “best defenses”, so perhaps it’s fairer to say we are ranking the best “team point prevention seasons”. So which teams had the best point-prevention seasons? Here is a table of the top 25 since the 2000 season. Teams highlighted yellow won the Super Bowl. The 4th column above “LAVG-PPGA” just shows the point margin for each team above (actually below in this case) the league average. As we can see, there’s a lot of yellow (SB champs) and a lot of Green (Eagles), but no overlap.. 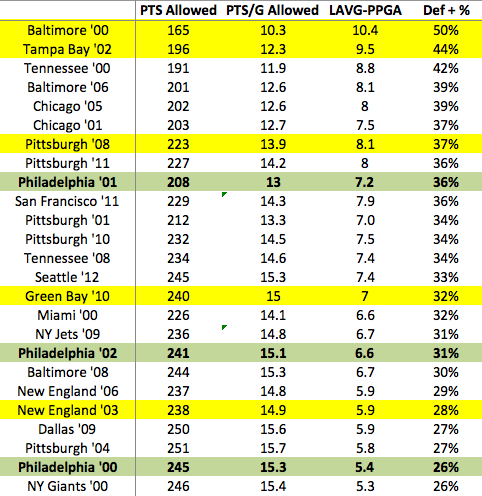 The 2000 Baltimore defense, which we all knew was great, was a full 50% better than the rest of the league. As I mentioned above, if we remove the Ravens from the league average that year, their performance would be even better, breaking the +50% mark. The Buccaneers team that beat the Eagles in the NFC title game was a HISTORICALLY great defensive team. There was a lot of hand-wringing in Philly after the game about how inept the offense was (particularly the receivers), but the simple fact is, the Eagles ran into a figurative defensive wall. One almost as strong as that famed Baltimore defense mentioned above. Also of interest is the placement of Green Bay ’10. While Aaron Rodgers gets a lot of credit (as he should), the strength of that team was really the defense. It might also be strange to see New England featured twice on the list (including the ’03 SB team), but the early Belichick era was really built on that side of the ball. Notably, despite all their regular season success, the Patriots last SB win came in ’05, during their “defensive” era, as opposed to the “offensive” era we’ve seen from them more recently. To be fair, the “offensive” Patriots did GET TO the SB twice, losing close games to the Giants in each. As I did with the defense, here I am looking purely at Points Scored. The same caveats apply. The only thing I’ve added is Red highlighting for Super Bowl LOSERS. 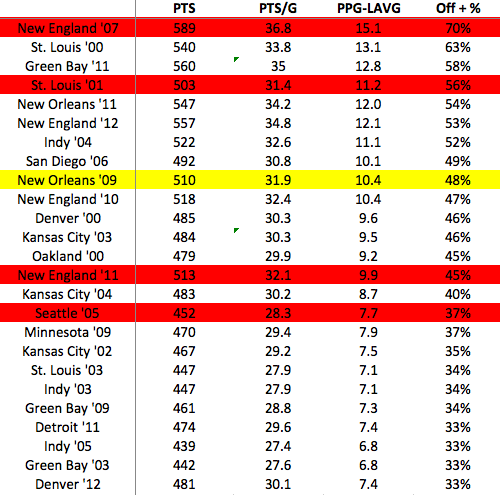 While we didn’t need this table to tell us the 2007 Patriots were a great offense, it really is incredible just how much better than everyone else they were. Even accounting for points inflation, no team since 2000 (and I’d be surprised if any team in modern history) comes close. The 2000 Rams were also an amazing offense, 63% better than league average, and yet that team is still 7% below the 2007 Patriots mark. Perhaps most surprising here is the lack of yellow (i.e. Super Bowl Winners). As I’ve explained before, it is NECESSARY to have an above-average offense if you want to win the Super Bowl. HOWEVER, a truly GREAT offense guarantees you nothing. Contrast this chart (1 winner in the top 25) with the Defense chart above (5 winners in the top 25), and it looks like, all other things being equal, having a Great defense trumps having a Great offense. The Eagles, obviously, do not appear on this list. For all of Andy Reid’s offensive skill (and he has a lot), that never translated to a truly great offense. Looking at yesterday’s tables, the Eagles never really came that close either. Again, the Patriots “offensive” era shows up a lot here, though it hasn’t translated to more Super Bowl wins. Great stuff; I have an interesting idea that you may wish to explore. The problem with this data set is that it does not necessarily say how teams performed against other top competitors. A team may have faced a weak strength of schedule and had the opportunity to run up the score on pathetic defenses and/or stop weak offenses (cough NE). Perhaps a better way to determine who the truly “elite” units were would be to solely look at their performances during the playoffs. This would show how the well the teams performed against to tier competition. Due to small game sample size, I would suggest only examining the final four teams each year. This would guarantee at least a two game sample, with at least one victory. Judging by how these teams performed on offense/defense across their playoff runs, we may shocked to find out that amazing teams during the regular season struggled (Chargers), and poor teams during the regular season dominated (Giants). This would also help us discover whether a team’s offense or defense truly won them the Superbowl. You would also be able to use the playoff data comparably with the regular season to opine whether their is a correlation between regular season success and Superbowl victories, or if simply a team needs to get hot at the right time. Lots of other great data points would be accessible too, like whether offense or defense wins championships, and whether Flacco had a truly historic Superbowl run. Interested?